This is an XGA resolution, LCD projector which outputs 4500 lumens and has a wide throw range on the lens. Technical Specifications The PLC-XU106 offers 4500 ANSI XGA resolution as well as dual data inputs a single video input and a dedicated monitor redrive. The PLC-XU106 is a new cabinet design utilises a new generation 0.8” LCD panel to deliver increased brightness and offers a 1.6x zoom lens developing a throw ratio of throw 1.15-1.85:1. 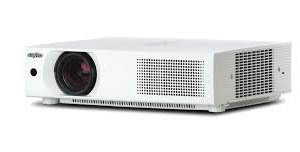 Mid range XGA projector with 4500 lumen output and all the usual features, and some unusual ones such as corner keystone. Good range on the optics. A fantastic workhorse in a compact case.